Jerry and Wanda Kopanski founded the Cornerstone Estate Winery in 2002 and opened the winery in 2005 to the public. 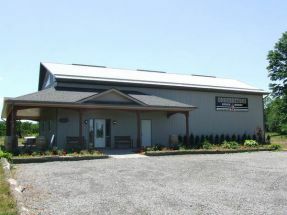 The family owned and operated Niagara Winery is located in Beamsville Ontario, in the Niagara Peninsula. The 20 vineyard located adjacent to the winery and grows Cabernet Franc, Chardonnay, Gamay Noir, Vidal Blanc, Souvignon Blanc, and Riesling. To compliment the fantastic wines are the wide variety of tree fruits located in the vineyard, which create the fabulous fruit wines produced here. Cornerstone Winery focuses on producing small amounts of VQA certified wines.